Born in Liverpool in 1960, Clinton Chaloner studied Botany and Zoology at Newcastle University before graduating in Fine Art from Bretton Hall College in 1994. Since then his interests and career have spanned the arts and sciences. Funded by the British Academy he went on to complete an MSc in the History and Philosophy of Science at Imperial College. He has lectured for a number of years at Imperial and at University College London while researching a PhD in the history of scientific photography. Subjects he has taught include the History of Technology, Ethics in Science and Technology and the Philosophy of Science. As well as making numerous presentations of his own research he has written articles for such diverse publications as the British Journal for the History of Science and the Journal of the Landscape and Arts Network. His first commission was to design a major installation for the London Barbican’s hugely successful interactive Shakespeare exhibition ‘How to be Bottom’. Since 2001 he has been engaged on a series of commissions for large-scale environmental and public art. Central to many projects has been the involvement of school and community groups where children and adults can contribute as well as learning woodcarving and other skills. The work itself frequently owes its form to close observation of the natural world – in particular of microscopic forms, unseen processes and life cycles. He has established a studio in a spectacular mountain location in North Wales where he runs creative workshops. Log On to the Severn - devised and managed Heritage Lottery Funded project to recreate a working replica of an ancient dugout boat on the River Severn in Shrewsbury. Woodhenge - a circle of giant sculptures. Working with youth groups at Hainault Forest Country Park, Redbridge, Essex (Due for completion in 2008). Taking Part - Education Action Zone project to create a sculpture trail with eleven Peckham Primary Schools and the Livesey Museum for Children, London. All the King’s Men (in collaboration with artist Cheryl Hughes) - Heritage Lottery funded commission involving local people in the creation of sculptures to commemorate the Battle of Shrewsbury in 1403. Breaking New Ground - community arts and educational residency for English Nature at Castle Eden Dene Nature Reserve, Co Durham. Re Create - project for Tiptree Heath SSSI, Essex. 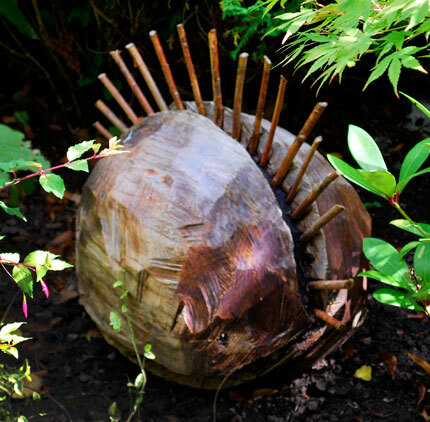 Wood sculptures and way markers in collaboration with local schools and environmental agencies. Secrets of Stonehenge - Pioneer Productions project for National Geographic. Television series Naked Science. Archaeological reconstruction of a replica bronze-age logboat. 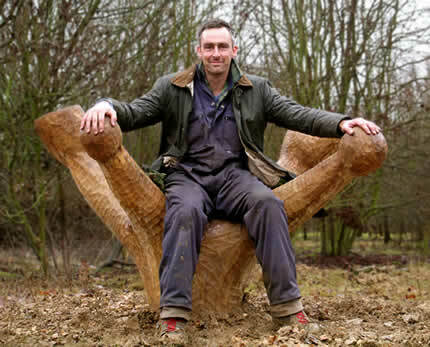 Design and construction of interpretative sculptures for a woodland nature trail at Hainault Forest Country Park, Redbridge, Essex. Wood sculptures for Wickford School, Essex. Cultural Waves - project to create a 36’ dugout canoe for Lee Valley Park, London. 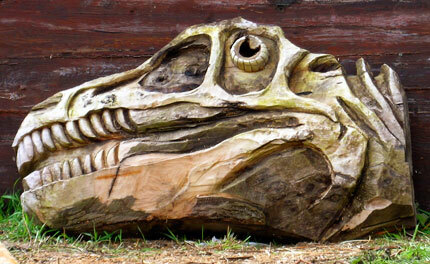 Wood sculpture for Waterlow Park, N. London. How to be Bottom - a major interactive exhibition bringing Shakespeare to children through art. A collaboration between artists, designers, musicians and computer software developers. London Barbican Centre. ‘The Most Wonderful Experiment in the World; A History of the Cloud Chamber’, British Journal for the History of Science, September 1997. Regular contributions to the Journal of the Landscape and Arts Network. The artist has been closely involved in the construction of three dugout boats. The first of these, the eleven metre long ‘Messenger’, was the outcome of a community arts project for Lee Valley Park. It competed in the Thames River Race in 2002 and also featured at the London Boat Show. The second was a 7.5 metre replica of a Bronze Age vessel from Lincolnshire. It was produced for National Geographic’s documentary ‘Secrets of Stonehenge’ in their Naked Science series. It was also seen in the BBC’s The Trees that Made Britain. The third, at 4.5 metres, is a replica of an ancient boat from Ellesmere in Shropshire, now in the Shrewsbury Museum and Art Gallery. It has been shown across the country as an educational exhibit and recently played a role in the documentary ‘Stone-age Atlantis’ for National Geographic. This boat is available for events both on and off the water and offers a unique opportunity for a hands-on historical experience. If you are interested please contact the artist. The artist will undertake private commissions. He is happy to make site visits in order to give advice and also to consider the use of locally available materials where appropriate. For example you might have a tree about to be felled that could be worked on site to create a sculpture without incurring the cost of sourcing and delivering materials. There are sometimes items for sale. Many are made from durable woods, typically oak and yew, so they may be sited outdoors if required. 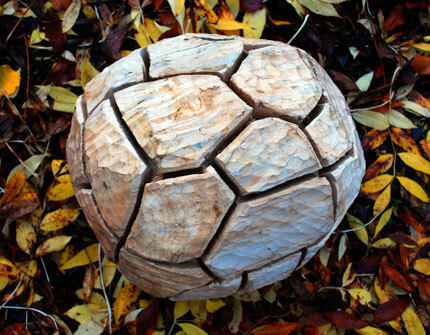 Items made from less durable woods can be treated or sited in less exposed situations. All materials are from sustainable sources.